WASHINGTON (CNN) -- What the country could easily see this week was a major success story for the Obama White House: A confirmation drama featuring Judge Sonia Sotomayor that left even Republican critics predicting an easy path to confirmation. CNN's John King says Republicans think they'll gain more ground on pocketbook issues than on Sonia Sotomayor. But just as Sotomayor was making major advances, a bigger initiative from President Obama, health care reform, was dealt a bruising body blow. Douglas Elmendorf, chief of the Congressional Budget Office, said this of the leading Democratic health care proposals in the House and Senate: "In the legislation that has been reported, we do not see the sort of fundamental changes that would be necessary to reduce the trajectory of federal health spending by a significant amount and, on the contrary, the legislation significantly expands the federal responsibility for health care costs." Translation: The bills, as they stand, do not meet the president's promise to reduce the long-term drain of health care spending on the federal budget. To be sure, it is relatively early in the process. And Democrats have already proved they can adapt when given sober analysis from the CBO. One reason the Senate Finance Committee, for example, has not yet voted on a health care reform proposal is an earlier CBO analysis suggesting the leading committee proposal at the time would not only cost more than Democrats believed but would also make only a modest dent in the number of Americans without health insurance. Democrats have big majorities in the House and Senate, and a president whose support, while declining, remains the envy of the political world. Still, Republicans jumped at a chance for at least temporary bragging rights. "Americans are concerned about the rising costs of health care, but instead of alleviating those fears, the Democrats government takeover will drive health care costs even higher," House Republican Leader John Boehner said in a statement. White House officials played down the sober analysis, noting that neither the House proposal as it now stands nor the Senate Health, Education, Labor and Pensions Committee proposal is viewed by the administration as anywhere near a final product. The White House goal is to get versions passed by each chamber and then negotiate a grand compromise this fall. Fair enough, but CBO testimony and the Republican gloating only exacerbates the growing concerns among conservative and vulnerable Democrats about the pricetag of health care reform. Then add in complaints from Senate Finance Committee Chairman Max Baucus, a Democrat, that Obama is hurting his own top cause by not embracing a proposal to help pay for health care by taxing employer provided insurance benefits. King: Will health care reform reach rural America? A top Senate Democrat involved in the effort put it this way at the end of the day Thursday: "Two committees passed health care bills this week, but you can plausibly argue we lost ground." No time for panic, this Democrat said, but he did call for better coordination and more direct involvement from the president. Republicans are trying to make political gain of the Sotomayor confirmation drama as well, looking past the momentum her nomination has in the Senate and hoping some of the issues raised this week might help some Republicans in next year's midterm elections. • Someone who has embraced racial preferences and set-asides. • Someone who has placed foreign law on the same level as the U.S. Constitution in matters of jurisprudence. • Someone who has advocated taxpayer funding of abortion. • Someone who embraces judicial activism and rejects judicial restraint. Sotomayor backers called the Reed memo ludicrous, suggesting it ignored her testimony and her 17-year record as a judge. And many Republicans involved in the proceedings undermined such arguments with their praise of Sotomayor's record on the bench. "Mostly in the mainstream," for example, was how Sen. Lindsey Graham, R-South Carolina, described the nominee's record as a federal judge, even as he sharply criticized many of her speeches as "disturbing." 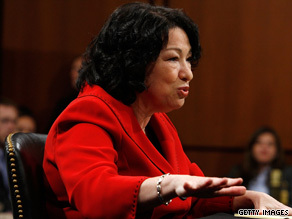 Cultural conservatives clearly want the debate over Sotomayor to continue well past her near certain confirmation vote. But the actions of the Republican National Committee in recent days offer a telling glimpse at what the party sees as its best opening heading into the 2010 midterm cycles. The RNC launched two Web videos objecting to Sotomayor's record and statements, and loyalists who get the party's tweets could see a running critique of her confirmation performance. But the bulk of the RNC releases to the mainstream media this week focused on rising unemployment and the higher taxes and fees Democrats suggest to pay for health care reform. In a choice between the "culture wars" of the courts and an election cycle framed on taxes and spending the role of government, the early bet of most leading GOP strategists is that the latter provides more opportunity. And, while it is early -- very, very early -- most leading Democrats agree that jobs, heath care and other pocketbook issues are their pressing concern.